Look at the dinosaur figurines. Coincidentally, all the dinosaur comes in pairs. One is on four, the other on two. So I tried to arrange them in this position, and see, aren't they perfect? I know what are you thinking, you hamsap! Err, pot calling the kettle black, I'm like that too, gee. Wait, out of topic. Kenzie boy sleeps like that now. Does your kid sleep like that too? He looks like a frog. Boo! We had some time that day, so we took the kids out for jalan-jalan. I always take pictures (of the food) when we (could) eat out because I always feel it's a rare occasion, hehe. Believe me, ever since having Kenzie 3 years ago, we seldom go out, eat out, make up, dress up & show up! Ahem, nice phrase, eh? 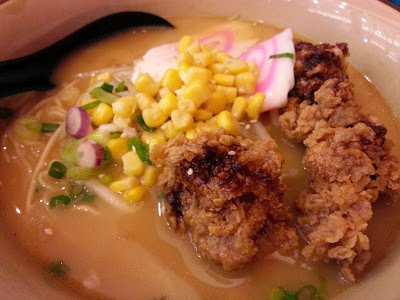 Anyway, back to the topic, that afternoon, we settled at Ichiban Ramen, located inside Jusco Cheras Selatan - the hub's favorite. 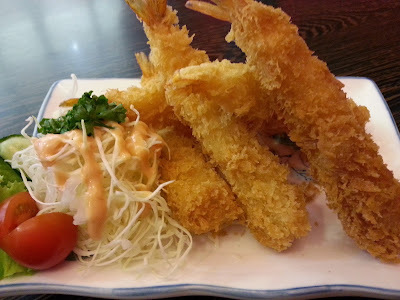 We ordered fried ebi for appetizer. Prawn tempura served with a simple salad. Next, we also ordered gyoza for appetizer. I must have gyoza if I dine in a Japanese restaurant. I can't live without gyoza. I heart gyoza so very much. 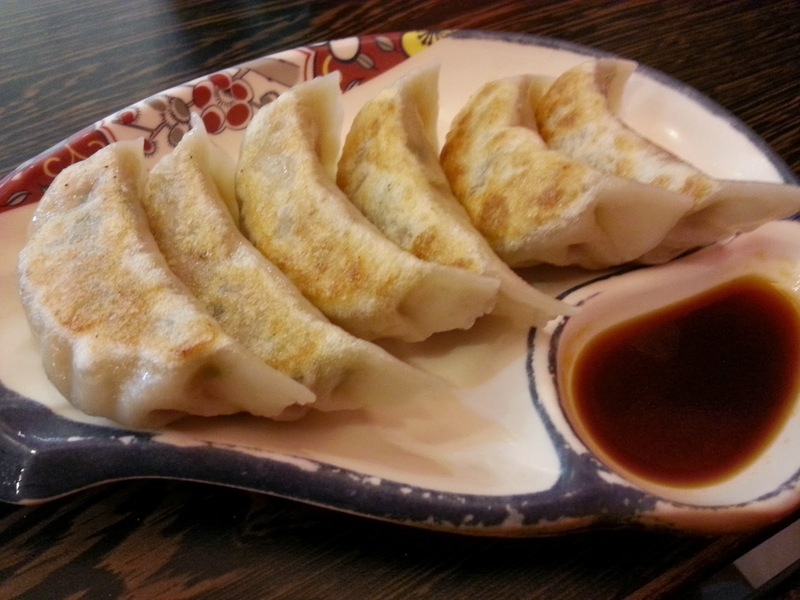 Talking about gyoza, whenever I dine at Esquire Kitchen, I must order their Shanghai dumplings (woh-teep), either the fried or the steamed ones, or both. 12 each. Means I can finish 24! The hubs had beef ramen. It was so good. The soup was very flavourful. I had the chicken karaage ramen. Don't ask what is karaage, because I also don't know, haha. I only remembered the menu written as karaage. I didn't bother asking the waiter what is karaage as there was a picture of this in the menu, so by looking at the picture, it looked safe and ok, so I just went ahead and ordered this. Kid's meal at RM12.90 per set. 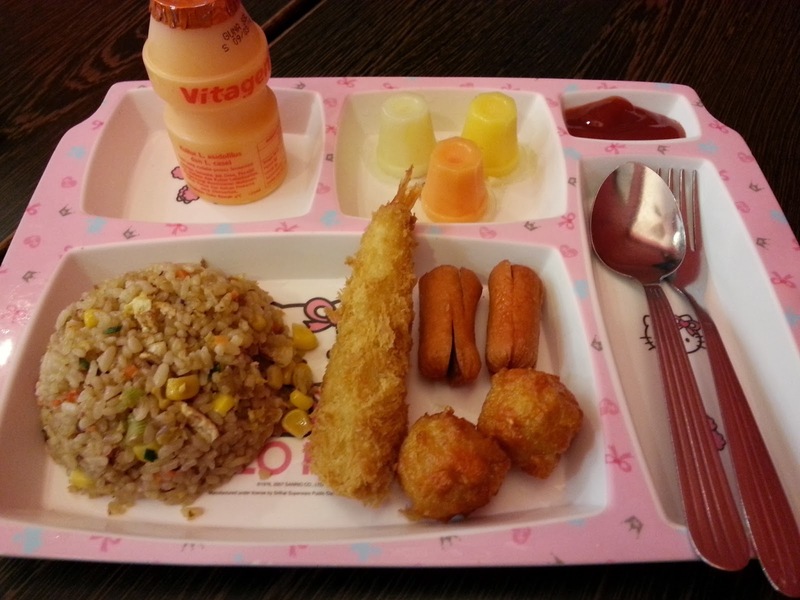 Fried rice set with prawn tempura, sausages, assorted balls, jelly and a Vitagen. Spot that cute adorable Hello Kitty plate? 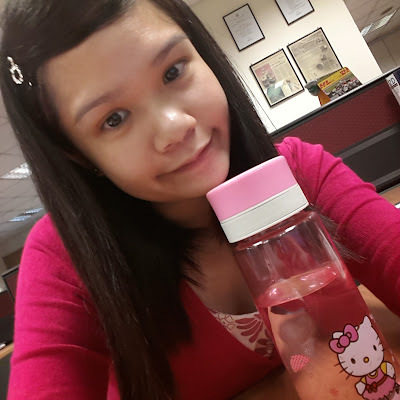 Wait, I have a Hello Kitty water bottle too. Let me put my picture here first. Say cheese! Needless to say, Kenzie did not touch anything on his set except 1 piece of jelly and he finished the whole Vitagen. Lord, please help me. I am willing to do anything to see Kenzie eat normally. Please answer my prayers, Amen. Cute kan? I also find it cute, that's why faster snap pictures.. But really looks like a frog hor..
Kekeke, yeah, call me hamsap.. I am..
Wah, all your comments sum up is already longer than my post 3x.. Errr, for me to know, for you to find out.. kekekeke.. no la, actually I arranged it when Kenzie was around.. He still small la, doesn't know what is this position.. When the figurines couldn't balance or when they dropped, he said "ooops, what happened?" HAMSAP POH!!!!! Wakakakakakaka.... I wanna die laughing! High 5 Thambee!!! I no need announce also most of you all already know I hamsap lor.. Ok lah, shhhhh, suspense.. Later no more market value.. Oops, blogger value? Errr, cute value? Whatever... Lalalalalala..
Yep, I don't like the way he zzz too. 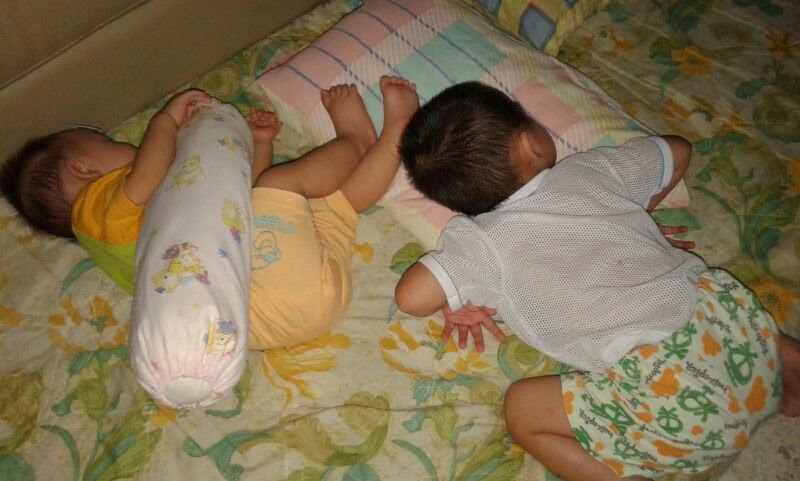 This was taken by my mum, when they were zzz in my mum's house the other day.. She whatsapp-ed to show me.. I told her to keep an eye, or interrupt his sleeping position.. Imagine his fingers would be twisted if he tried to turn his body around..
Yeah it is true that mothers are supposed to help the babies sleep properly as twisted fingers and sprained arms often happened. I was a victim and my mum always said I slept like python!! She said I let the blanket coil me up and gagged my throat!!! Then I was not python la. I was having battles with python in my sleep la! Oh yes, I can eat 24 gyoza at one time.. Neh, I like to dine at Shogun, kan? In Shogun ahh, sometimes they gyoza (sometimes they don't).. When they have it ahh, I will sapu all the gyoza and the chef/waiter would have to replenish again, kekeke.. Errr, hamburgers, I don't think I can eat 30 like ah chan la.. But fish fillet burger from McD, I think I can eat 10.. The fish fillet burger very soft and not very big, can telan la.. Sometimes seminggu baru berak 1x.. Where the rest went? aiyoh, stuff so much inside and yet only berak once a week only??!! eih, Princess Ribbon must make a video of herself walloping all the 24 gyoza and 10 filet-o-fish lah.. else really hard to imagine that woh..
aiyoh, how come served the kids meal in Hello Kitty plate?? so disgraceful for a boy lah.. they must have a few sets of those cartoon plates mah.. like Hello Kitty, Barbie, Hanna Montana for the girls.. and for boys probably Ben 10, Cars, Transformers etc mah.. and then when they see cute uncle like SK, probably Doraemon or Minions!! muahahahahaha~~ eih, come to think about it, maybe because the mother loves Hello Kitty herself, so she asked to have the Hello Kitty plate instead?? Twice we dine here, twice also they serve in Hello Kitty plate for kids.. First time round, forgot to take pictures and Kenzie already dig in into the ketchup liao.. So 2nd time round, I made sure I snap pictures first when the plate came.. No other cartoon characters la, just Hello Kitty, kekekeke..
hmmm, Kenzie boy doesn't want to eat things?? errr, one thing the elderly always say is that this boy "gam jik".. i don't really understand this term lah, but i think it could mean there are worms in his stomach so he doesn't have appetite and eat only little.. go to see doctor and ask for something to feed him lah, no harm trying also mah..
Oh yes, we feed him Zentel liao.. But he is still the same after Zentel.. I remembered my mum fed me with Comandrin when I was around 6 years old, then when I poo-ed ahh (in the potty), then I look back at the potty, eeeeyer, really got worms wriggling on the poo leh.. But with Kenzie, no worms in his poo, just macam normal poo only.. I often bring my parents to eat at Esquire Kitchen though their food is not the best and not cheap at all. Somehow their menu has some dishes that suit my very old parents and myself. Their one outlet is at the shoplots which allows the car to park right at their door for my mum to wobble inside fast. Oh yes, agree with you.. My parents also like some dishes from Esquire Kitchen.. Price not cheap, they increase their price every now & then.. The price for 2 persons sometimes hit RM70+ if we "kiu soong"... If we only eat their noodles and order two types of "woh teep", then the price is around RM50+.. 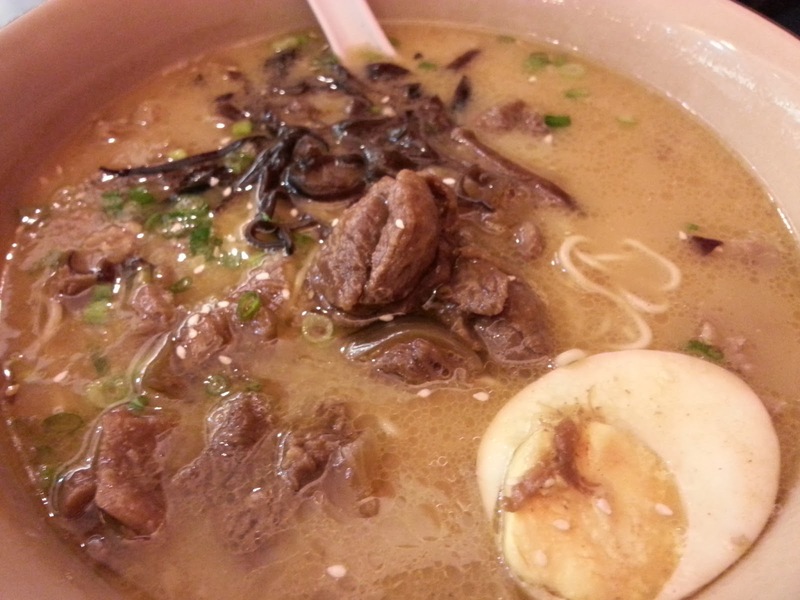 Your ramen photo is making me drool and salivate like crazy! In another 10 days I will be feasting the best Hakata Ramen. Stay tuned. Call me jakun.. What is Hakata? But you know hakuna matata? Yes, this one I know.. The favourite word from that boar from Lion King yes? Lovely dino figurines. I dont think that is hamsap pose lah. Hehe. Kids are like that. When they dont eat, we as parents worry too much. My kids are like that too. Just make sure they drink milk and take some health supplement to replace the lack of nutrients. I also wonder when my 8yo girl can be more adventurous and eat more. Sigh. Yep, when kids don't eat, we, parents, "sum tong" (heart pain) pulak.. I'm hoping Kenzie will at least eat a normal meal once a day (solids).. He is always on milk and cereal only (Nestum).. If I can eat, you can too.. Remember you could eat 1 nasi ayam and 1 nasi campur? We are similiar, woman ! Heh..
Maybe your boy didn't like rice because they are harder to bite... so try giving him soft porridge or rice with lots of soup inside.. :) My 2 cents..
Good morning. Wah...so random post wor. Ok what to comment. ..
Random ahh? Ok ma, got "sun sin kum", not so routine lor.. You in mamak now? Eat what? Aiyo ... so ham sup ! The ramen looks good, looks very authentic ! The dinosaurs Kenzie punyer la.. I naughty, arrange in these hamsap positions, keke.. Oh, Kenzie likes Dibo also.. Everytime request wana watch Dibo.. Dapat free from milk formula lstime.. Collected 4 DVD's. Lol.....funny way of sleeping. ..but then I guess we did that too whn we were young. I think so.. Maybe I also zzz like that when I was small hor.. But I see very cute la, keke.. I bet J boy doesn't zzz like that now since he big boy liao..
My son loves dinosaur too. 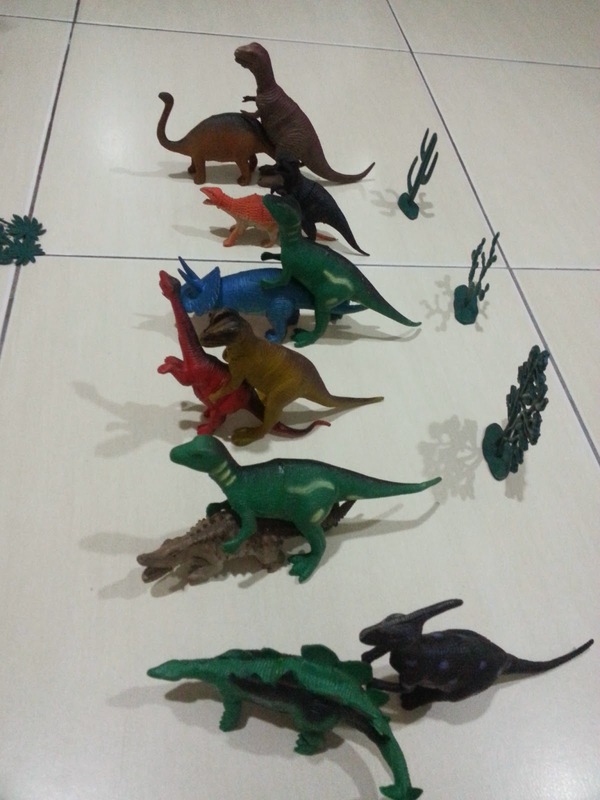 Till now (primary 2) he is still playing with his dinosaur toys. And he loves to read stories about dinosaurs. Wah...24 dumplings ! Your appetite is amazing ! I think kid not eating is a phrase le. Both my kids also experienced something like that. But as they grow, they will start to request to eat this and that. Did your boy snack on something before the actual meal ? Sometimes snacking at the wrong timing spoilt the appetite. Yep..I also like to look at the picture and I can look at this over and over again. Heeeehh..
Ai yo... You said that your son sleep like a frog. I can understand your frustration about Kenzie not eating all his food. Is he not feeling hungry at all? Is he fussy with food all the time? Sometimes, he can be tired or not feeling well...??? Hope that your G is recovering well from chicken pox. hehe.. dinosaurs toys, nice.. my kids love them too. i call woh tip pot stickers. and I LOVE EMMMM. been craving for them since morning. O: om nom!